A few weeks ago I took a mini-vacation down to my favorite area of Florida, Seagrove Beach on beautiful 30A. 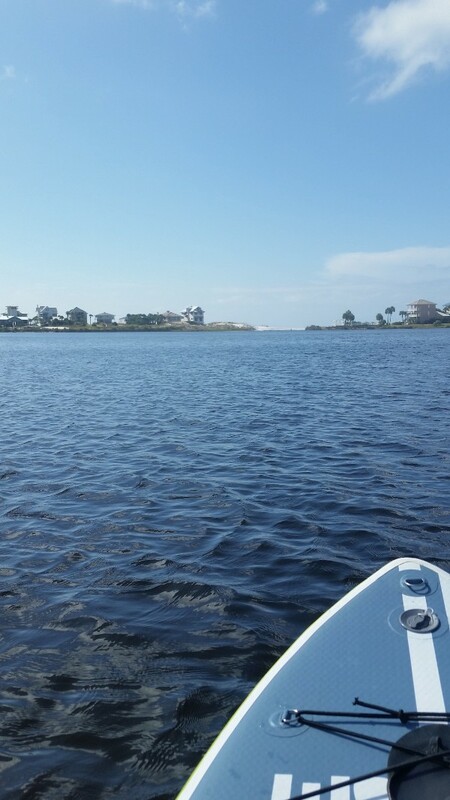 I was anxious to get my paddle board out on the beautiful emerald waters of the Gulf of Mexico. But the beach’s warning flags told me I should re-think my plans. There was a purple flag indicating dangerous marine life, and a red flag indicating high hazards and strong currents. So, I improvised and took my board out on Eastern Lake, a rare coastal dune lake that runs under scenic highway 30A and eventually feeds into the ocean after a heavy rain or other inflow. Because it is a coastal dune lake, Eastern Lake is rather small. And since there hadn’t been a previous heavy rainfall to create an opening to the ocean, the sandy beach served as a barrier between the lake and the ocean. I paddled from the beach end (the south end) where the salt water mixes with the fresh, to the marshy north end where I’m sure some alligators make their home. It was only about a mile and a half from the beach barrier to the marsh end of the lake. Needless to say, for someone who is used to paddling on rivers with an unlimited amount of distance available, I felt a bit trapped. Unlike the ocean, I didn’t have a wide open space to explore, so all I could do was just keep paddling in one big circle around the perimeter of the lake. Despite all the beauty surrounding me and the change of scenery from my regular paddle route, the feeling of going around in circles made me frustrated. Sometimes we don’t always get what we want when we want it, so be patient. Just enjoy and be content with and grateful for the beauty of your current place/situation. Things will soon change for the better. Wait to make your move until conditions are more favorable. Pay attention to the warning flags. You’ll keep going in circles if you don’t step out of your comfort zone. Don’t wait for an opportunity to come open. Make your own opportunity. I’m still not sure which of the above lessons I was supposed to learn that day. But the experience of feeling blocked in or trapped is one I’ve felt more than once in my career, whether it was when I was trapped in a toxic office environment, or when I was restless because I was not working in my purpose. In two instances, I waited patiently for the conditions to be right to make my exit, and spent my time wisely planning my course of action for when the appropriate time arrived. In one instance, I stopped focusing on the warning flags and took a leap of faith. I know which approach has worked best for me, but in general I can’t say for sure that either of those approaches is better than the other. And I can’t say that there’s one approach that fits everyone experiencing the same frustrations because everyone’s journey is different. What I can do is coach my clients on the approach that works best for them, their personal situation, and their unique goals and strengths. Which lesson from the list above speaks most to your current situation? I always love sharing paNASH Success Stories, and here’s another one! I’ve been working with this client for about six months. When I first met her, she was coming out of a very successful career as a professional athlete, and didn’t know what was next for her. She had a lot of interests, skills, and creativity, but didn’t know how to put them to use. She was working a retail job that didn’t match any of those skills or interests and hated it. Since we started working together, she has quit her retail job, explored a variety of possible career options, and has rediscovered her previous passion for writing. She has also rediscovered her love for all things design, including graphic design and interior design, and is putting into action a way to help her and her family prosper. She is using her love for writing to write for her husband’s home improvement and renovation business’s company blog, and she is revamping her own interior decorating blog she started a long time ago. In addition, she is using her graphic design skills to improve the brand and promotion of her husband’s business, resulting in new clients. And, she is developing her interior decorating talents to keep current clients by providing a “next step” service for them after their home renovations are completed. It is the perfect complement to her husband’s own business and passion. It took some time for this client to arrive at this plan. She was trying several different things and considering an array of possible options. This often made her feel like she was aimless and all over the place. I reminded her this is a season of experimentation for her and encouraged her to embrace it. Some of the biggest lessons she says she’s learned from the coaching is to not try to fit someone else’s mold and to not listen too much to what other “well-meaning” family members say she should be doing. She’s instead learned to take the talents and interests that go all the way back to her childhood and discover ways to incorporate them into adulthood. Adulting doesn’t mean letting go of your childhood passions. It just means learning how to rediscover those talents and interests and develop them in a responsible way that benefits the world around you. Is it time for you to do this? Let’s talk! Do You Want to Be More Confident in Your Career?